A mobile security app funded by New York City launched today. NYC Secure, available for both the Android and iOS platforms, provides free mobile security for those who can't afford to pay for their own security tools. It's all part of Mayor Bill de Blasio’s NYC Secure initiative, designed to protect New Yorkers online. The app does not access user's personal information, and doesn't need an internet connection to function. 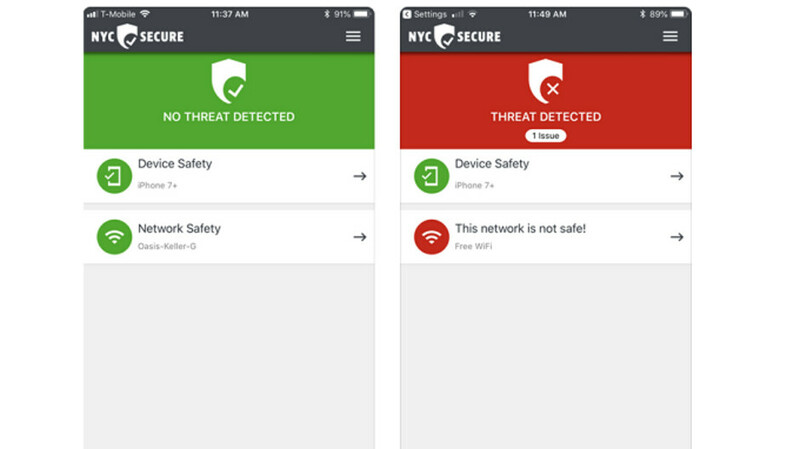 The NYC Secure app will alert users when they should disconnect from a suspicious Wi-Fi hotspot, or if they have unsafe settings on their devices. It also will tell them when to delete or pass on an app that is dripping with malware. Those in New York City can use the app free of charge, and there are no ads or in-app purchases offered. The NYC Secure app uses 4MB to 6MB of data a day on Android (after using 14MB to 16MB to install and setup). On iOS, the app uses 3MB to 5MB of data daily (after using 7MB to 9MB of data to install and setup). Those with iOS 9.0 and higher, or Android 4.4 and higher can install NYC Secure by clicking on the appropriate link: (iOS|Android). Your hard earned taxes at work for something that no one will download or use. Bring down the rents!